Limited Edition of 500 Copies On Purple Colored Vinyl. 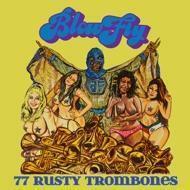 "77 Rusty Trombones" is the final studio album by legendary and influential Miami singer, songwriter and producer Clarence Reid aka Blowfly, the original nasty rapper. Reid has had a career spanning 50 years that saw him pen songs for Betty Wright, K.C. & The Sunshine Band and Sam & Dave among others. The new album is a return to the form of his classic releases including "The Weird World of Blowfly" that heavily parodied R&B hits.